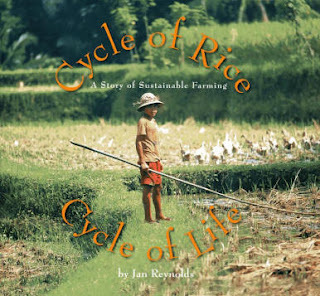 As Jan Reynolds explains in CYCLE OF RICE, CYCLE OF LIFE, a stunning photo/picture book from Lee and Low, the so-called Green Revolution almost destroyed sustainable farming practices in Bali. CYCLE OF RICE is a tale of hope, illuminating for kids how an ecologist with vision can help local people restore the land and revitalize their economy. Read this with your kids before eating a bowl of rice.